How to calculate the stopping distance? Even if you're not a driver, you surely know that the car doesn't stop immediately after hitting the brakes. From the moment you spot a potentially dangerous situation, to the moment when the car comes to a complete stop, it travels a certain distance. 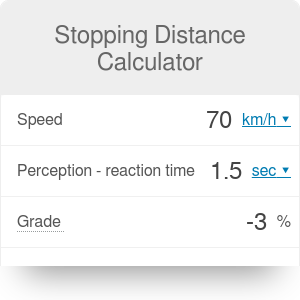 You can use this stopping distance calculator to find out how far your car travels in that time, depending on your speed, the slope of the road, and weather conditions. In this text, we will clarify the difference between the stopping distance and the braking distance. We will also explain how to calculate the stopping distance according to AASHTO (the American Association of State Highway and Transportation Officials). Imagine that you are driving your car on a regular street. Suddenly, you notice a child that runs across the street ahead of you. What happens during the next few stressful seconds? First of all, some time will pass after the event began to happen, but before you react to it. This period is called the perception time. During this time, the car continues to move with the same speed as before, approaching the child on the road. You might think that you hit the brake immediately, but there is always a small delay between the moment you notice the danger ahead and the instant in which you actually start to decelerate. This delay is called the reaction time. The car is still moving with the same speed. After you start braking, the car will move slower and slower towards the child until it comes to a stop. The distance traveled from the moment you first hit the brake is called the braking distance. The stopping distance, on the other hand, is the total distance traveled during the perception and reaction time summed with the braking distance. In the book "A Policy on Geometric Design of Highways and Streets", AASHTO gives the formula for calculating the stopping distance. This formula is commonly used in road design for establishing the minimum stopping sight distance required on a given road. With correct parameters, it's a perfect equation for an accurate calculation of the stopping distance of your car. f is the coefficient of friction between the tires and the road. It is typically assumed to be equal to 0.7 on a dry road and in the range from 0.3 to 0.4 on a wet road. 2.5 seconds - the worst case scenario. It is highly probable that also elderly or intoxicated drivers will manage to react within 2.5 seconds. To determine the stopping distance of your car, follow the steps below. Determine your speed. Let's assume that you're driving on a highway with the speed of 120 km/h. Decide on your perception-reaction time. Let's say that you had a good night sleep before the road, but have been driving for some time now and are not as alert as you could be. You can set your perception-reaction time to 1.5 seconds. Find out what is the slope of the road. If it is flat, you can just enter 0%. Is the road wet or dry? Let's assume it just rained. With a speed of 120 km/h, our braking distance calculator gives the value of the friction coefficient equal to 0.27. Your car will travel 260 meters before it comes to a stop. Stopping Distance Calculator can be embedded on your website to enrich the content you wrote and make it easier for your visitors to understand your message.